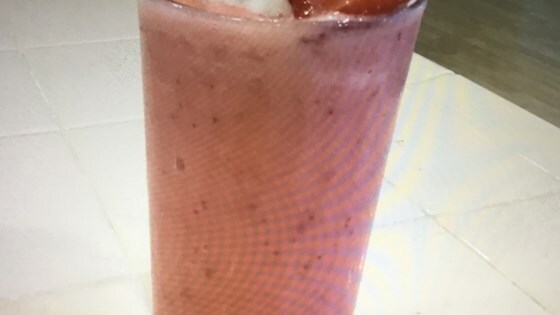 "It's a great summer drink with peaches, milk, strawberries, and ice. It is a great drink to cool you off." In a blender, blend the peaches, strawberries, milk, and ice cubes until smooth. Watch how to make a healthy yogurt and strawberry smoothie in your blender. This was one of the yummiest smoothies I've ever tasted. Only I added a little more strawberries then nessacary and it came out great!!! This recipe needs some serious tweaking. Even after adding extra fruit, extra milk and even some yogurt it still wasn't very good. Was not good at all - really lacked a sweetness I thought would come from the strawberries. Add some sugar??? Me and my family loved this recipe!We added a half-cup of sugar to sweeten it up (for four servings)It also tastes great frozen into a fruit pop! why do people rate this down if its sooo! tasty! This is a VERY good recipe. It doesn't taste like a smoothie! (In a good way!) Very yummy and delicious. I didn't give any to my family I just ate it all!